Tinder has filed legal papers threatening to stop Shinder, a dating app featuring just one man, from registering a trademark. Tinder has threatened to launch a trademark battle against a dating website that by design only shows the profile of one man – its founder. Shinder is the brainchild of Shed Simove, a serial entrepreneur, author and motivational speaker, who launched the site in the hope of getting a date. He claims that he's found 150 matches through the site so far and that he's been on three dates. The site, which has the tagline "Quality, not quantity", gives female users just one profile to like or reject: Simove's. Male members are told: "Unfortunately, Shed is a full blown heterosexual at the mo. But please keep in touch using the links below." But when Simove applied to register the Shinder trademark, Tinder, owned by the giant dating company Match Group, filed a Notice of Threatened Opposition at the intellectual Property Office. Companies typically do this when they consider a trademark application to be too similar to their own. 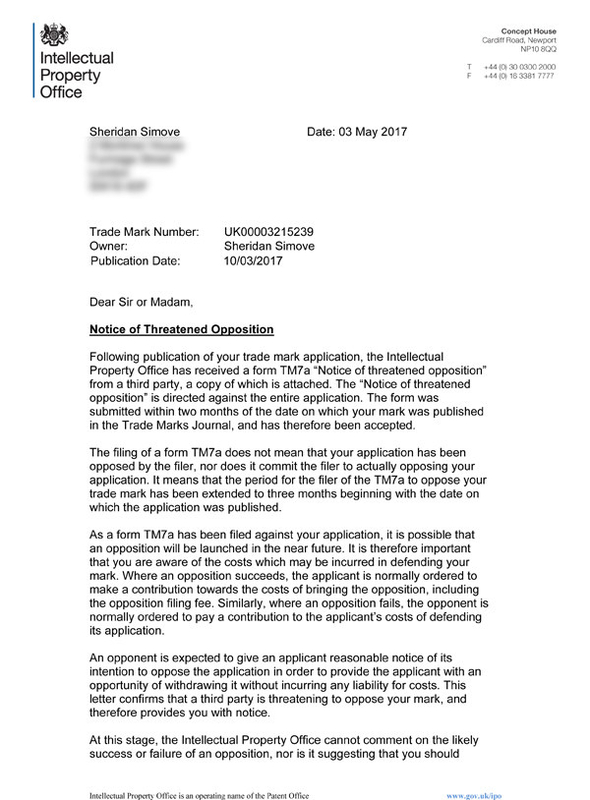 The Intellectual Property Office has told Simove that he may have to mount a legal defence in order to retain the right to file the trademark, in event of a formal trademark opposition notice. Simove received a letter from Schindler, the maker of lifts and escalators, asking him to confirm he doesn't intend to enter that market. The letter said: "We propose that you provide a written undertaking that the trademark 'SHINDER' will not be used to distinguish goods and services related to elevators, escalators, moving walkways and access control systems." 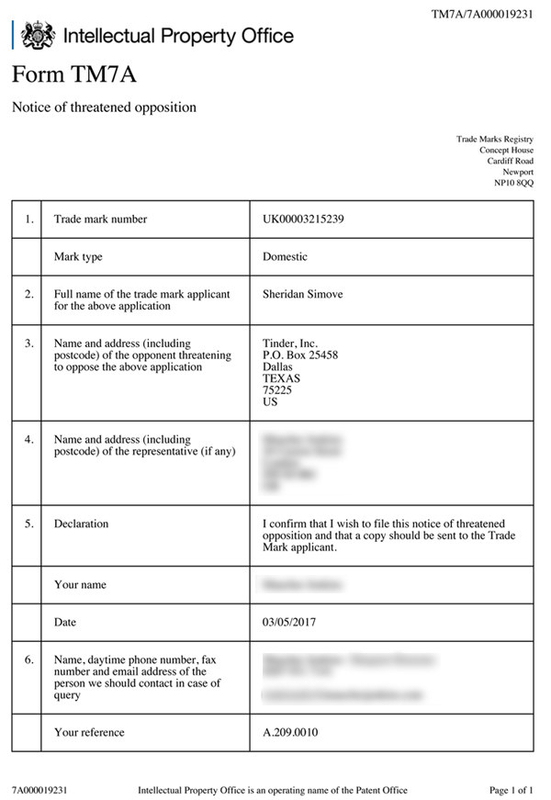 This is not Simove's first trademark battle: He's previously faced claims from Apple, Google, Ann Summers and others who took issue with some of his novelty product range. The producers of The Apprentice TV show filed their objection to a toy handgun Simove developed that fired out a little flag featuring the catchphrase "you're fired! ", although in that case the producers paid him a four-figure sum to abandon the claim, which he accepted. Simove told BuzzFeed News: "I'm never materially damaging these businesses' income streams, so I always talk to the lawyers and say 'Come on guys, let's be adults here', even though we're dealing with a childish thing. "It's a bit of a David and Goliath struggle, with me as David and I always come out OK in the end." Simove said he's considering making the site's functionality available on a white-label basis, so that other individuals can start a dating site featuring themselves. And he's adamant that Shinder is not merely a PR stunt: He really wants to find a relationship. He launched the site after previously attempting (and failing) to find dates on Tinder by setting his profile image to him emerging from an egg with the caption "Tinder surprise", and by declaring himself "Pick of the Month" on dating app Bumble, even though no such thing exists. "I've had 150 matches and they were from all the around the world, such as Russia and America – that's the only reason I've been on so relatively few dates," he said. "I genuinely want to meet people through this. I'm on other dating platforms, but all through my life I've tried to give myself a competitive advantage. It's frustrating for any man to be one fish in a massive pond full of many fish – I spent nine months and a lot of money building Shinder and I thought about giving up. But I upped my game and I built my own pond." BuzzFeed News has contacted both Tinder and Schindler for comment.